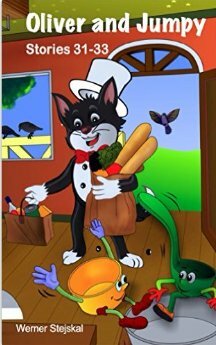 If you haven’t read any of the Oliver and Jumpy stories, you are in for a treat. Oliver is a stylish tomcat who is best friends with Jumpy and Joey, two kangaroos. The first tale takes place on New Year’s Eve in Oliver’s treehouse. Every year the crockery and cookery in his kitchen come to life to entertain Oliver and his friends. Children will delight as the colorful objects cook, clean, dance, and play music, a delightful and innovative way to celebrate New Year’s Eve. In the second adventure, the three friends are playing with the whales making their way down the coast to Antarctica. But Joey gets a bit too rambunctious when he goes for a swim and a shark comes up to eat him. Oliver will have to devise a clever ploy to save his friend’s life. The third tale is reminiscent of Alice in Wonderland. When Oliver enters a special door of a local castle, he transforms himself into a tiny creature. Oliver becomes a tour guide for us as he leads readers through the minuscule world of caterpillars, beetles, ants, and lady bugs. We will learn what it is like to a speck in a big universe. Beautifully illustrated with color that is a feast for young eyes. These stories teach preschool and primary school children important moral lessons and appreciation for animals, plants and the world we live in. We haven’t met Oliver and Jumpy around here. I think my kids would enjoy them! Love having you as a part of Booknificent Thursday! I love being here…..Haven’t met a reader yet who doesn’t enjoy Oliver and Jumpy.